Within a few seconds, we were outside wondering what was going on. From what I hoped was a safe distance away I looked back to see a grandson politely holding the door for everyone as they left the building. “This is not a good time to be so polite,” I remember thinking as I called his name for him to leave his post and scurry to safety along with the rest of our group. Standing there, random thoughts of perils kept running through my mind: Perhaps somehow a robbery is involved. Is it a bomb threat? If it is a bomb, are we far enough away? Is this a terrorist thing and someone is about to blow themselves up or start shooting everyone? When the situation was not resolved within a few minutes, we left the area to go to another restaurant. As so often happens in a large city, the evacuation of the restaurant did not make the news and apparently nothing happened other than the restaurant’s business was disrupted and the patrons were inconvenienced, some mid-meal. Our event appears to have been a false alarm. Sometimes though, the alarm is not false. Sometimes the person strolling through the crowd is not a law enforcement official helping everyone to safety; he or she is bringing violence and death into the peace of everyday lives, forever changing families, communities, and nations. Today, the World Health Organization attempts to track and report trends regarding violence. Their belief appears to be that the rule of law would curb most violence, if enacted and enforced in every nation throughout the world. They report: “The enactment and enforcement of legislation on crime and violence are critical for establishing norms of acceptable and unacceptable behaviour, and creating safe and peaceful societies. 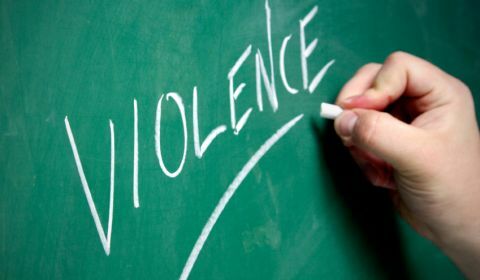 On average, the laws surveyed were reported to exist by 80% of countries but to be fully enforced by just 57%” (Global Status report on Violence Prevention, 2014). of course, “acceptable behavior” would logically include a common belief system that encourages respect for all and violence toward none, which unfortunately, is not universally accepted. While the World Health Organization is not religious in any way, they have stumbled upon the purpose of government in the world from a biblical perspective. World governments are identified as serving God in a special way, not as part of God’s kingdom, but as protectors of the common citizenry by using the fear of punishment as a deterrent to violations of law. Paul was inspired to write: “Let every soul be subject unto the higher powers. For there is no power but of God: the powers that be are ordained of God. Whosoever therefore resisteth the power, resisteth the ordinance of God: and they that resist shall receive to themselves damnation. For rulers are not a terror to good works, but to the evil. Wilt thou then not be afraid of the power? do that which is good, and thou shalt have praise of the same: For he is the minister of God to thee for good. But if thou do that which is evil, be afraid; for he beareth not the sword in vain: for he is the minister of God, a revenger to execute wrath upon him that doeth evil. Wherefore ye must needs be subject, not only for wrath, but also for conscience sake. For for this cause pay ye tribute also: for they are God’s ministers, attending continually upon this very thing. Render therefore to all their dues: tribute to whom tribute is due; custom to whom custom; fear to whom fear; honour to whom honour” (Rom 13:1-7). One area of increasing violence today involves killing in the name of religion, either because of the religion of the murderer, or because of the religion of those being killed. Jesus talked about those who would think they were serving God in killing the disciples: “They shall put you out of the synagogues: yea, the time cometh, that whosoever killeth you will think that he doeth God service. And these things will they do unto you, because they have not known the Father, nor me” (John 16:2-3). While those words were addressed to those who would be first century Christians, it is amazing how very current they are today in many places around the world including the United States. Today, none who are persecuting those who claim any allegiance to Christ are doing anything new. They are at the end of a long line of those who have done the same throughout the centuries. In the first days of the church, our brother Stephen was killed when an angry mob threw rocks at him until he died (Acts 7:58-59). On the heels of Stephen’s death, a zealot named Saul decided to do his best to destroy the Lord’s church. “And at that time there was a great persecution against the church which was at Jerusalem… As for Saul, he made havoc of the church, entering into every house, and haling men and women committed them to prison” (Acts 8:1,3). Imagine being at home in those days when the banging on the door was a demand to know if there were any Christians inside. At that moment, the inhabitants faced a horrible situation: lie and live (maybe), or tell the truth and die a horrible death. either choice had both immediate and eternal consequences. Years later, when Paul talked about that time in his life, he remembered the violence in which he participated. “And when the blood of thy martyr Stephen was shed, I also was standing by, and consenting unto his death, and kept the raiment of them that slew him” (Acts 22:20). He also recorded: “I verily thought with myself, that I ought to do many things contrary to the name of Jesus of Nazareth. Which thing I also did in Jerusalem: and many of the saints did I shut up in prison, having received authority from the chief priests; and when they were put to death, I gave my voice against them. And I punished them oft in every synagogue, and compelled them to blaspheme; and being exceedingly mad against them, I persecuted them even unto strange cities” (Acts 26:9-11). Since Paul was a witness against those who would not recant their faith in Christ, he was also most likely among the first to throw rocks at them to kill them (Deuteronomy 17:6-7). We are to be thankful for those in our nation whose work is to protect all citizens and to administer appropriate punishments allowed by law regardless of religious affiliation. At the same time, we need to remember it is not our place as Christians to be administrators of those punishments. Vengeance is not ours (Hebrews 10:30) and carnal battles are not ours to fight: Jesus said to Pilate, “My kingdom is not of this world: if my kingdom were of this world, then would my servants fight” (John 18:36). A practical application of these truths is that we cannot serve in the military, or in a gun carrying position of law enforcement, or in a political system as a judge or legislator. Refusing to participate in the law’s vengeance does not prevent us from taking advantage of all the rights we have as citizens of the land in which we dwell. Paul used his Roman citizenship to avoid being flogged (Acts 22:25) and to appeal his legal case before Caesar (Acts 25:11). This was within his rights as a Roman citizen and was not a violation of the law of God. Of course, there is no guarantee that all the laws of any nation will be appropriate for Christians. It may be that some laws of a land are contrary to the Bible’s instructions. In that event, we have no choice but to respectfully decline to follow that particular law since we must obey God first(Acts 5:29), even as we do our best to be loyal and faithful citizens of our nation. For example, if the freedom to assemble were withdrawn, we would quietly gather for worship anyway. If violence against those who believe in Christ comes to our community, or even our home, may we have the same faith and courage as all those who have suffered and died because of their faith in God. The Holy Spirit inspired special mention for redeemed martyrs: “And when he had opened the fifth seal, I saw under the altar the souls of them that were slain for the word of God, and for the testimony which they held” (Revelation 6:9- 10). If government based persecution happens where we live and it appears dangerous to continue to live there under such circumstances, it is difficult to know what course is best. Still, it is not appropriate for Christians to arm themselves and become part of a movement to drive out the government. The scriptures tell us to “honor the king” (I Peter 2:17). We have Bible examples of what others did in similar circumstances. When the church was persecuted in Jerusalem after the death of Stephen, most Christians fled from the area so they could live where there was less danger (Acts 8:4). Similarly, when the Roman ruler Claudius did not want any Jews in Rome, Aquila and Priscilla left town and found a new place to live in Corinth (Acts 18:2) Moving to a new area in our community, another state, or even another nation may all be considered if persecution invades where we live. As God’s faithful, our task in a world of increasing violence is to remain a people of peace. Paul wrote, “Recompense to no man evil for evil. Provide things honest in the sight of all men. If it be possible, as much as lieth in you, live peaceably with all men” (Romans 12:17-18). In my recent restaurant experience, it was frightening to be asked to leave, to have the peace of the moment disturbed. I cannot imagine what it was like to be in San Bernadino, California, Roseburg, Oregon, Charleston, South Carolina, and Paris, France when multiple individuals were slaughtered there in recent months. Let us not forsake our faith and let us not be afraid in such difficult times. rather, let us remember the words of Jesus as he instructed the twelve: “And fear not them which kill the body, but are not able to kill the soul: but rather fear him which is able to destroy both soul and body in hell” (Matthew 10:28). “Filthiness” – Any thing base or vile in words or acts. “Which are not convenient (which are not fitting)” – They do not come up to the proper standard; they are utterly improper in themselves, and highly unbecoming in those who profess Christianity. An obvious takeaway from Ephesians 5 is that crude “humor” is not funny. Paul is challenging Christians to prove their devotion to God by their action—to be mature. Although it may be popular even in the current culture of the church, this form of speech is not “cool” and it should not make you feel good. Paul asserts that faithful attendance to worship services alone does not make one faithful if he or she is not faithful in speech and conduct. And although modest dress professes godliness (1 Tim. 2:9-10), modest dress does not make one godly if his or her speech and conduct do not exude modesty. Attend faithfully and dress modestly, but do not neglect modesty and faithfulness in word and deed. Christianity is not just a club with a few rules; Christianity is a lifestyle. If we are to be imitators of God, should we boast in our unrepentant slander? Should we spew unbecoming, unholy speech? Are the words we speak fitting for a Christian? Speech is an indicator of a man’s heart (Luke 6:45). Before we can imitate God, we must “cleanse the inside of the cup (Matt. 23:25-26).” We cannot imitate him unless we do (Matt.12:34). Let us be urgent to purify our hearts. ​There are at least three very influential religious sects that profess Jesus to be a good prophet, but deny His deity. Perhaps, there are more than three, but Muslims, Mormons, and Jehovah Witnesses comprise a large body of religious followers the world-wide, and they all have this faith in common. Muslims uphold the Koran as God’s preeminent revelation to man. Mormon’s do the same with the Book of Mormon, and Jehovah Witnesses have gone so far as to attempt retranslating the Bible and disassociate any references to Jesus as God in the New World Translation. Still, with all this rejection of Jesus as God, all these groups claim Him to be a good prophet. Obviously, none of these groups have heeded Paul’s words in Colossians 1. ​In Colossians 1, Paul exhorts the Colossians for being faithful. This had been reported to him by Epaphras, a member of the Colosse Church of Christ. 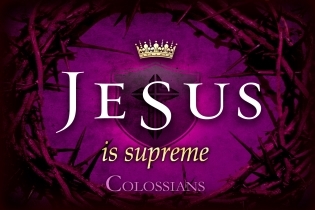 In verse 9, Paul begins a prayer for the Colossian brethren, and starting in verse 13, he begins to describe to them the supremacy of their savior Jesus Christ. He gives nine distinct qualities of Christ’s supremacy before ending the first chapter. ​First, Christ is God, yet Christ took on human flesh so He could be the perfect sacrifice and mediator for man (Col. 1:15,19, 22). Second, Christ is the creator of the universe (Col. 1:16). Third, Christ was able to create all things because He preceded all things (Col. 1:17). Fourth, Christ is the source of energy for all creation (Col. 1:17). Fifth, Christ is every Christian’s hope that they will all be resurrected and glorified in the flesh as Jesus was the third day after crucifixion (Col. 1:27). Sixth, Christ is preeminent over Muhammed, Allah, Joseph Smith, Mary Baker Eddy, and any other false prophet that would discredit the Messiah (Col. 1:16, 18). Seventh, Christ died to redeem the sins of everyone including Muhammed and Joseph Smith (Col. 14, 20, 21, 22). Unfortunately, both of those men denied Jesus deity and will have to beg for His forgiveness on judgment day. Eighth, Christ is God Himself, or as Paul puts it, “The image of the invisible God,” (Col. 1:15). Ninth and last, Christ is head of the church of Christ, the only body by which men have hope of salvation (Col. 1:18, Eph. 4:4). Now listen to Jesus own words, “I am the way, the truth, and the life. No one comes to the Father except through Me,” (John 14:6). ​Ironically, all the aforementioned groups that would propose Jesus to be a good teacher and the Bible to be a good book have blatantly disregarded the first chapter of Colossians. Most every one of these mainstream religious bodies would say the Bible is a good book, but clearly they would not make such a statement in light of Paul’s teaching in Colossians 1. One thing is for sure, Christ is supreme over every human and spiritual being, and it is before Him that every knee shall bow and give account to on judgment day (Rom. 4:11-12). There will be many times in the Christian’s life that we will face temptation and sin, but if we take a step back and look at sin for what it really is an important question comes to mind, it is one asked by Paul in Romans 6:21 “What fruit did you have then in the things of which you are now ashamed?” The “things” of which Paul was speaking was a past life in sin, he wonders what they profited from that life. Likewise we must ask ourselves this same question, Paul made it clear none have escaped sin (Romans 3:23) so I wonder what does the Bible teach we profit from sin? Some might say that in sin they were able to make more money; and as we look at this notion on the surface it seems to be true, but scripture paints a different picture. Matthew 26:15 recounts the deal between Judas and the Chief Priest for the betrayal of Christ and what they counted to him was “30 pieces of silver” Albert Barnes says “the whole sum, for which Judas committed this crime, was fifteen dollars”. Some might think that to kill Christ the devil would have set up His betrayer in a palace surrounded by all the worlds’ pleasures, yet he failed to offer Judas any substantial amount. The prodigal son (Luke 15:11-32) would express the same sentiment. Sin doesn’t profit your bank account. Others then might answer Paul and say that living according to one’s own wants and desires allows for a happier life. And to be honest, there is some happiness in sin. I think sometimes that Christians are reluctant to admit that sin isn’t always, at first, miserable. In fact, the writer of Hebrews said that Moses “refused to be called the son of Pharaoh’s daughter, choosing rather to suffer affliction with the people of God than to enjoy the passing pleasures of sin” (Hebrews 11:24-25). There will be pleasure in sin, temporarily. But when we look at a man who had all the pleasures one could ever wish, he tells us something that goes against popular opinion, Solomon says in Ecclesiastes 2:10-11, “Whatever my eyes desired I did not keep from them. I did not withhold my heart from any pleasure. . . Then I looked on all the works that my hands had done and on the labor in which I had toiled; and indeed all was vanity and grasping for the wind. There was no profit under the sun.” If there was something King Solomon’s heart desired he bought it, this way of life led him away from God because of this, when he looked back upon his life he would say “Therefore I hated life” (Eccl. 2:17). Living a life in sin has no profit in our life and constantly fail to bring you happiness, and it will only drive you to in the end hate life. 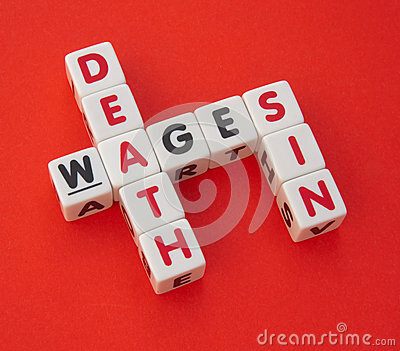 If wealth and happiness are not the profit of sin, what is the fruit which we get from living in sin? To find the answer we don’t have to look outside of our first verse, Paul states in Romans 6:21 “for the end of these things (sin) is death”. What then does the Devil have to offer us? He fails in giving us happiness, he fails in giving us wealth. Therefore when we take an honest look at the whole picture of sin we find that the devil has nothing to offer us but death. ​In nearly every one of Paul’s epistles, you will find a common pattern. Paul, writing by divine revelation from the Holy Spirit, wrote a practical section in each of his letters that instructed his reading audience in things they must be grounded in so as to remain faithful in God’s eyes. Paul did the same thing in this second letter to young Timothy. The scriptures that provide the basis for this article are indicators of Paul’s practical teaching to Timothy, but these passages also point to something else. We know from historical and biblical accounts that Paul was in bonds at the time he wrote this letter, and we also know from this same letter that Paul had acknowledged the fact that his death was drawing nigh. This letter, by many accounts was the last that Paul would write. How fitting is it that the man who once sought to destroy teachers of the gospel wrote his final epistle as a great worker for the Lord to a young man who he had trained to carry on the gospel? Paul and Timothy had been together many times through trials and triumphs. Towards the end of this last chapter, Paul writes a heartfelt plea in verse 21 asking Timothy to “come before winter.” The apostle understood that it was unlikely he would make it through the long months of bitter cold that awaited him. Yet we should pay close attention to what Paul instructed Timothy to do right from the get go. Regardless of whether Timothy made it to Paul before he died in fetters, the late apostle said, “Preach the word!” Up to this point, Paul had given all he had to the Lord since his conversion, especially in the preaching of the gospel. By admonishing Timothy in this, it is certain that Paul sought to secure the growth of the Lord’s church in the hands of God-fearing, spiritually grounded men like Timothy. But notice what Paul says in verse 3. 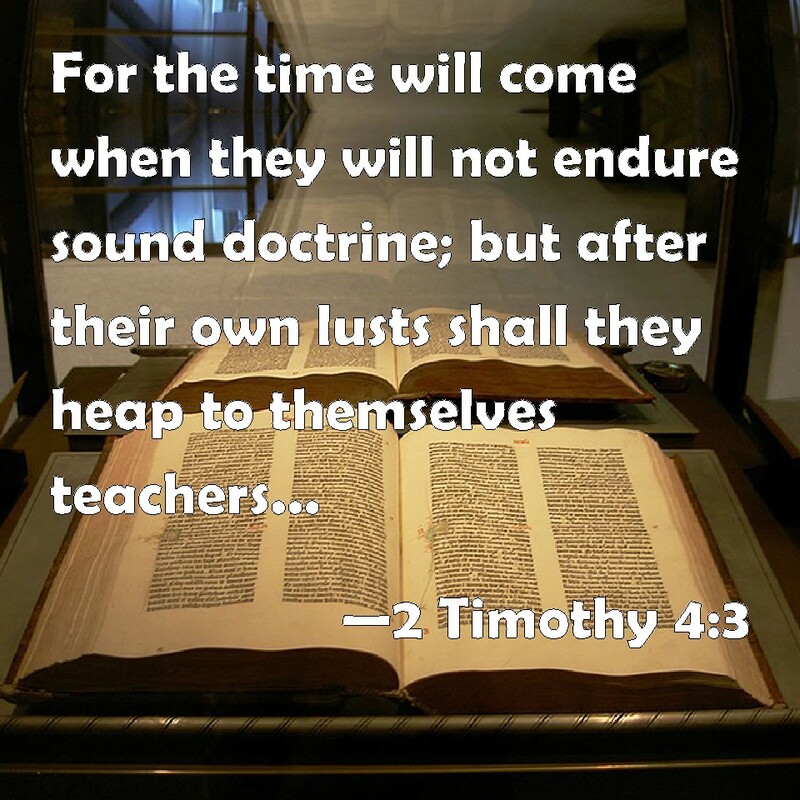 Timothy had to preach the word because, “the time would come when “they” would not endure sound doctrine; but after their own lusts shall “they” heap to themselves teachers having itching ears.” Paul makes a prediction. The “they”in this verse refers to the people of earth. He tells Timothy that there will come a time, in Timothy’s life and beyond, when he would encounter people who would no longer be content with God’s Word alone. The time Paul spoke of has long since come, but IT HAS NOT passed! The world that we now live in is the manifestation of what Paul warned would come. In this current age, much of the so-called “religious world” has sought out people who will tell them what they want to hear, rather than what God’s Word teaches! Folks nowadays want to hear teaching that tickles their ears rather than exhorts them in the righteousness of the Word! As a result, denominations and religions of all kinds have sprung up since the days of Timothy, all of which were built on foundations of fables. So for the members of the Lord’s church in this modern era, we may only give the truth in which to strive towards IF…we again PREACH THE WORD holding back no reproof, rebuke, or exhortation.